Banc de Crypto Review – Legit Investment Fund or Scam? Banc de Crypto claims to be the world’s first private cryptocurrency investment fund. If you were considering investing into this fund, we sincerely advise that you read this comprehensive and objective Banc de Crypto review first. Below you will find all the necessary information needed to help you make a safe and informed decision. What is Banc de Crypto? Banc de Crypto is describing itself as the world’s first private cryptocurrency investment fund, allegedly in possession of revolutionary blockchain-powered investment technologies, which yields a monthly ROI of 30%. As stated on their website, Banc de Crypto have built the most advanced, straightforward and transparent system void of any unnecessary mediators who needlessly chew away at clients profits. Their investment strategy is based on three different elements. These are Manual Trading, Algo Trading & ICO Participation. You, as an investor, are simply required to sign up via their main page and wait to receive a call from your assigned personal manager. Your personal manager will then set up an investment deal with you after discussing the terms and conditions, the sum of the investment and the trading strategy to be used. Using your personal digital signature, you are then required to transfer funds to the Banc de Crypto fund. Funds can be transferred in EUR, USD or BTC. Once the transfer is complete, they immediately exchange your deposit for BTC and allocate it to various assets. From time to time, your personal manager will update you with portfolio status updates and profit reports. You can also choose to withdraw your profits in EUR, USD and BTC or reinvest them into more assets. All client support and profit reports are conducted exclusively via Telegram messenger service. Alternatively, you can communicate with your assigned manager via telephone or email. Banc de Crypto claims to have a diverse portfolio in order to keep the balance between risk and return. The bulk of the portfolio consists of allegedly low risk yet high yield cryptocurrencies while the rest is comprised of speculative trading and ICO’s. Below is a representation provided by Banc de Crypto, which apparently shows their current portfolio in real time. Additionally, Banc de Crypto allege to achieve maximum protection not only through portfolio diversification but also via stop orders, insider information and risk management tools based on machine learning methods. Furthermore, they claim to be the only ones in the world aside from BitMex, who use Bitcoin derivatives to hedge trading positions. Although everything you have read so far in our Banc de Crypto review may sound sophisticated and appealing, especially to newcomers, we uncovered numerous warning signs and red flags that we feel potential investors should be aware of before blindly investing in this brand new so-called investment fund. Because Banc de Crypto is so new, there is not much information easily found online, but we managed to discover enough to make you think twice. To begin with, the website bancdecrypto.com was only registered on the 6th June 2017, making it almost 6 months old at the time of posting this review. What is concerning though is that as with most scammy sites, it was registered anonymously. This means we have no way of knowing who actually owns the site. This is your first warning sign that something is not right here. In addition to not knowing who owns or registered the site, there is no available information on who is actually running the supposed fund or who the CEO or founder is. There is no information on their team of experts either. Banc de Crypto claims to possess a team of 20 experts across six countries, some of which are traders in several different time zones, but who are they? With no available pictures, biographies or even names provided so we can at least check their business profile and background on LinkedIn. This is yet another serious red flag to consider. When it comes to investing, not knowing whom you are really investing with is never a bright idea. It is the same as giving your money to a stranger and hoping for the best. Banc de Crypto has a global ranking of 10,819,323 on SimilarWeb. It is also rather disconcerting that their social media profiles are dismal. For a financial service claiming to have over 2500 active investors, plus 20 new investors per day, the numbers do not quite add up. Furthermore, they claim to have executed 10 million trades to date with 8 out of every 10 trades being successful. According to their fund in figures, they have 6000 BTC / 18,000,000 USD in their active portfolio with a yield of 1690% on BTC and 2037% on USD. These are impressive numbers to say the least. Logic dictates that being in possession of these kind of figures; the word would have spread like wildfire by now. However, their Facebook page has a depressing amount of only 45 likes/followers and their Twitter account is even worse with only 18 followers. They do post regularly on their Facebook and Twitter profiles, but there is zero interaction on these. No comments, likes or discussions from the community or current investors. This is more than a little strange! We noticed something a little strange on their blog too. While searching for detailed information for our Banc de Crypto review, we came across their blog in which they post daily articles on Bitcoin, the future of cryptocurrencies and often include a technical analysis of the markets. Although their content is mediocre at best, the authors caught our attention. And not in a good way. We decided to take a look at two of the supposed authors and noticed that they were using fake profiles. 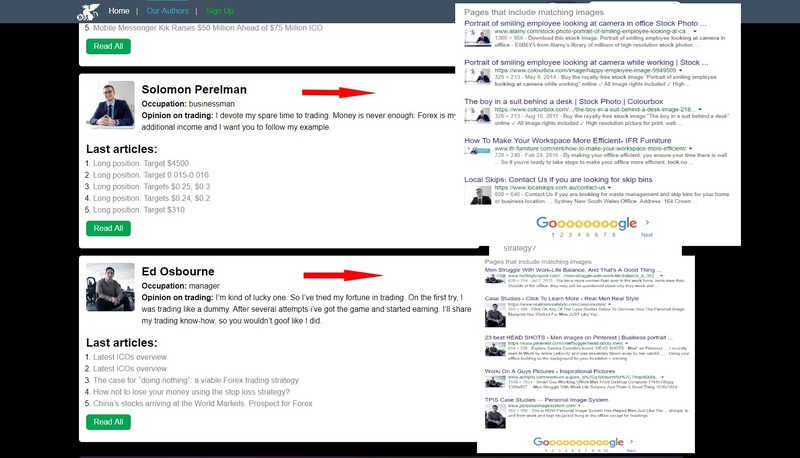 Solomon Perelman, an alleged businessman, and Ed Osbourne, a supposed manager, both use stock images as pictures of themselves. Together with their rather short and uninformative biographies, if they were trying to look professional, they missed by a long shot. Furthermore, the majority if not all of their blog posts only had about 3 comments on each of them, all of these were made by the same people, one of which was also using a fake profile picture of a famous person. So once again we are confronted by the fact that not only are they trying to hide their identities but it seems as if they are most likely interacting with their own articles in order to look like they are getting engagement. Banc de Crypto openly states that they operate exclusively on a success fee model, with no hidden payments, commissions, or entry/exit fees. Meaning if you do not make a profit then they do not charge a fee. However, what took us by surprise was the amount they take when profit is made. Their management fees start at 50% percent per $10,000, decreasing by 10% as the profit gets higher. That is ludicrously high! No ethical and decent investment company charges 50% commission or management fees. It is clinically insane. For example, if you earn $10,000 profit, they will deduct $5,000 in fees. Earning a profit of $50,000 will cost you a 40% fee of $20,000. A profit of $100,000 costs you a 30% fee of $30,000. A profit of $500,000 earns a 20% deductible fee of $100,000. I say SCAM – invested 300 USD with them and some bloke Eric Robinson (claiming to be American but Eastern European accent) has been calling me to invest more money. I told him I wanted to see statements and withdraw half my funds to make sure their system works, but no such luck and ignores my emails. 100% crooks!!! With the warning signs we uncovered in our review, we are currently left with no choice but to blacklist this service. Because the service is still new, we believe in being fair and objective so we are open to adjusting our review accordingly in the months to come should they prove to be a lasting and legitimate company. Until then, their status remains as untrustworthy. As it stands, Banc de Crypto has no proven trade or profit history, no identifiable employees or owners and preposterously high fees. This coupled with the fact that the investment fund is still new and there are no validated customers providing positive feedback, leaves this private cryptocurrency investment fund with little to no credibility whatsoever. We do not advise you to invest with banc de Crypto. Rather stick to reputable investment companies with proven records of accomplishment. Review Conclusion: Banc de Crypto cannot be trusted! Have you been scammed by BancDeCrypto? We encourage you to share any feedback, thoughts or knowledge you may possess by leaving a comment below! Are you frustrated and unsure which cryptocurrency sites you can trust? Visit our Cryptocurrency Investment Guide to learn about reliable and transparent investment opportunities. To stay ahead of the crypto curve, become a member of ScamBitcoin.com by subscribing where you will receive free reviews and scam warnings directly into your inbox! Scam company, glad i was able to get all of my money back from this scums! With the proper help, I was a happy man within a week! Philippe Ballesio, one of the biggest frauds in the United Kingdom and France, currently lives in England, where he spends his day on the net with different aliases promoting a series of fake websites that do not have the slightest of permits to market, makes with the intention of building a good reputation, to enhance the qualities and benefits offered by their businesses, although this person has many complaints about their practices and scams, as well as others who report sexual harassment to several women from different regions . With all the modesty, said to be a businessman and faithful to his accomplice, Mrs. Rosalie Lai Ballesio, who has become the partner of each of his robberies, is responsible for erasing all traces of evidence in each one of the scams made. He is an international thief who has swindled a large list of people online. Philippe Ballesio owns companies like CryptoMT4, which claims to be runners with an excellent reputation and sufficient potential to strengthen finances, but it is through this company that he has made his biggest scam. None of its companies has authorization to administer funds, sell cryptocurrencies, establish currency transactions, even for the official sale of gold, silver and assets, which they offer. Despite this, he used his fraudulent websites to steal, using fake users to convince others to invest. The French Authority of Financial Markets (AMF) has repeatedly warned Philippe Ballesio and has even issued warnings against Rosalie Lai Ballesio. Be very careful because the sites where the companies related to Philippe Ballesio operate as Cryptomt4 and that act as intermediaries do not have permits to operate, nor the authorization to establish themselves in the market, do not have an MT4 license. or MT5. Your scam technique is to offer accounts with a minimum deposit of 5 BTC through these platforms, in others ask for a little more, the innocent client decides to invest and transfer their money, the next day, the account is blocked and all funds they remain at 0, they assure that it is a virus that left all the accounts blank, but it is not like that. All they do is transfer the money to an account that is in the name of Philippe Ballesio or Rosalie Lai Ballesio and, sometimes, it is a false account of one of their fraudulent companies. The sale of PAMM accounts is also part of their scams menu. I guess this confirms my worst fears that I was scammed by this company and they are not responding to any of my emails now. They call and pester one when recruiting and once the transaction has been made they ignore and jump off to their next victim. As I was reading your review I was becoming more concerned for my investment. When I arrived at the part where you mention a Testimonial and they named the caller, it clicked – looks like I lost my investment. I joined with them in August 2017 and have had two reports, lots of phone calls from them – BUT – have never received any response to my emails and the mobile number I was given is not valid. Definite SCAM! Their so-called consultant sounds Eastern European but claims to be American. Invested 300 USD with them and cannot get it back, only calls pestering me to invest more.